A delectable make-ahead brownie dessert that is sure to please family and friends alike! 1. In a large bowl, cream butter and sugar until light and fluffy. Add eggs, one at a time, beating well after each addition. Add vanilla. 3. Transfer to a greased 13×9-inch baking pan. Bake at 350 degrees F. for 20 to 25 minutes or until a toothpick inserted near the center comes out clean. Cool completely on a wire rack. 4. In a small bowl, beat the cream cheese and confectioners’ sugar until smooth. Fold in whipped topping; spread over brownies. 5. In a large bowl, whisk milk and pudding mix for 2 minutes. Let stand for 2 minutes or until soft set; spread over filling. Refrigerate for 1 hour or until serving. 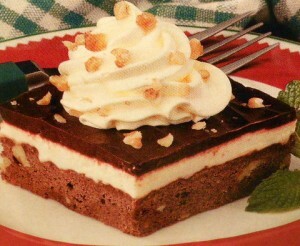 Cut into squares; garnish with whipped topping and nuts. Makes 12 to 15 servings. Recipe and photo are from Taste of Home magazine. Wow! Emily, this recipe is a keeper. It looks delicious. It is great for my family gatherings. I will have fun making this dessert for my dessert loving family. Our love for dessert is definitely a tradition started by my dad. A meal wasn’t complete unless there was a great dessert to eat. My mom knew how to keep her man happy. Smile.